I received a review copy of this title from the publisher. 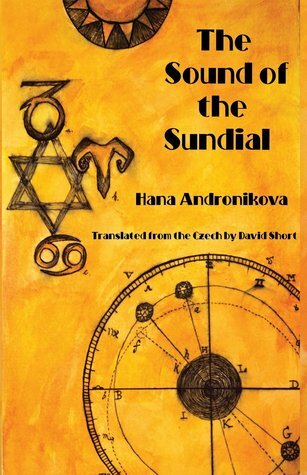 The Sound of the Sundial won the Czech Republic’s prestigious Magnesia Litera Award in the category of Best New Discovery, just a few years before its author died of cancer at the age of 44. It is making its world premiere appearance in English here from Plamen Press. This is the beautiful yet devastating story of a Czech family that is torn apart by the tragedies and atrocities of World War II. Rachael and Thomas are deeply in love and are the type of couple who perfectly compliment each other: Rachael has a fiery temper and is very passionate and impulsive while Thomas is calm, thoughtful and contemplative. Their relationship is traced in the book from its very beginning where they meet in Zlin when Rachael’s devoutly Jewish parents forbid her to have a relationship with Thomas who is not Jewish. Rachael, of course, defines her parents and marries Thomas despite their objections. Thomas is a builder for a prominent shoe manufacturer in Czechoslovakia and they send him to India in order to plan a new factory that will be set up in Calcutta. Quite a bit of the story involves flashbacks to Thomas and Rachel’s time in India where they are also raising their young son Daniel. The language of the book perfectly captures the sensual, beautiful and almost savage landscape of Calcutta. Rachael and Thomas return to Czechoslovakia when Rachael’s mother is dying. Unfortunately, this corresponds with the German invasion of Eastern Europe and the persecution of Jews. Thomas desperately tries to get his family out of the country before his wife is sent to the Ghetto but he doesn’t manage to do this before his wife is torn from their family. The scenes of Rachael’s removal and separation from her husband and son are heartbreaking. Eventually Rachael is sent to Auschwitz where her emotional endurance among deplorable circumstances is beyond description. Thomas and Daniel long to hear word about her and fight their own madness as they wonder whether or not they will ever see her again. This is truly a beautiful story about a family and their hardships that echo through the generations. Even though Daniel is an old man with his own grandchild the stories about his mother and father still bring him to tears. I highly recommend THE SOUND OF THE SUNDIAL for those who enjoy historical fiction set during World War II as well as an engrossing story.